The State Board of Education met at Howe Public Schools on Jan. 31, 2013. State Superintendent Janet Barresi said she wanted board members to see the advances the rural school district has made in the area of digital learning. "This school is the tip of the spear in this movement," Barresi said. "I wanted board members to be able to see what must become possible for districts throughout our state." She said as schools move toward online assessments and increasingly sophisticated learning they must be able to increase their bandwidth, be able to purchase the latest technological devices and provide appropriate professional development for teachers. Howe Superintendent Scott Parks said he and his staff started building their digital learning program by pursuing small grants, which eventually turned into larger grants. Former Technology Director Dr. Lance Ford explained that the vision for the district was to expand learning beyond the four walls of the buildings where students attend class. He said the staff engaged students in creatively thinking of what they would like to learn and do with technology. Last year, this led to a virtual field trip to President George Washington's Mount Vernon home. "We began by telling stories in our own back yard, and eventually that back yard became Mount Vernon," Ford said. Parks advised that when considering digital learning possibilities, districts need to dream big but most important is to start somewhere. 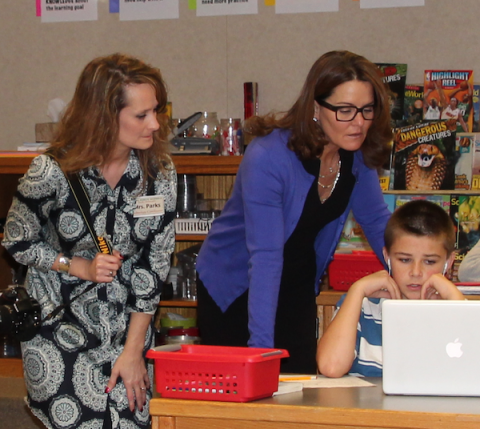 Cutline: Howe Public Schools Technology Director Tammy Parks, left, asks a student to show State Board of Education member Amy Ford a digital lesson. prom for senior citizens. He mows lawns and works in a community garden, delivering produce to area senior citizens. 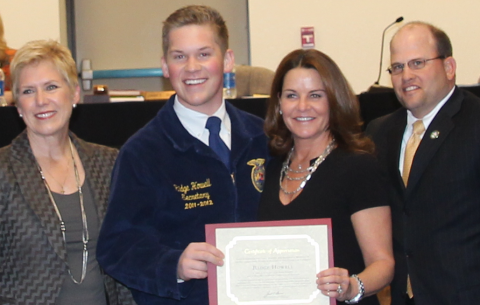 Howell's agriculture education instructor Jason McPeak attended Thursday's board meeting. Board member Amy Ford represents the Checotah area and helped present Howell with a certificate of recognition. Executive Director of STEM Jeff Downs updated the Board on the Think Through Math initiative, which is offered free to all public school students in the state in grades four through eight. As of Jan. 31, there were 267 school districts, 584 schools and 64,667 students participating in the math program, resulting in more than 8.4 million problems solved inside and outside the classroom since Sept. 1. Downs said the program helps students deepen their understanding of critical math concepts and offers grade level help including Algebra Readiness and Algebra I.
Stephen Martini’s fifth-grade math class at Cyril Elementary School in the Cyril School District recently won the first Oklahoma Math Cup, outperforming all other Think Through Math students in the state in the number of math problems successfully completed. Board member Lee Baxter, who represents the Cyril area, said this accomplishment made him especially proud as the district is small and has a high poverty rate. "This is an economically burdened community, but doing terrific things at the school," Baxter said. The Board awarded $400,000 in grants to six Reward Schools from across the state on Thursday. The schools are: Earl Harris Elementary School in Bethany, which will partner with Priority School Council Grove Elementary School in the Western Heights School District; Adair High School, which will partner with Priority School Okay High School; Ripley Elementary School, which will partner with Priority School Yarbrough Elementary School; Kingfisher High School, which will partner with Priority School Capitol Hill High School in Oklahoma City; Ryal Public School, which will partner with Priority School Hanna Elementary School; and Edmond Memorial High School, which will partner with Priority School Justice A.W. SeeWorth Academy Charter School in Oklahoma City. Grants were awarded to Reward Schools that are designated as high achieving in all state assessments or showing high progress in reading and math. As part of the grant application, Reward Schools had to propose a partnership with a Priority School, those that are in the bottom 5% of achievement in the state in reading and mathematics, have a graduation rate below 60% for at least three years, or have received a School Improvement Grant (SIG). Assistant State Superintendent of Educational Support Kerri White explained the purpose of the grant is to financially recognize Reward Schools while encouraging the sharing of successful practices. Only 14 schools applied for the grants, which ranged from $47,000 to $117,000. The Board also heard details of Oklahoma School Speed Test Month, which begins Feb. 1. Any student, teacher, or staff person on the school network can go to http://partners.schoolspeedtest.org/oklahoma and take a one-minute automatic test that will measure the available Internet capacity at their school. The OK SchoolSpeedTest measures the Internet connection speed in the classroom. This information will allow state and district IT staff to prioritize Internet infrastructure upgrades, and will be used as part of state and district budgetary process to make the case for increased investment in Internet access for schools. To learn more about the School Speed Test and EducationSuperHighway,go to https://www.edsurge.com/n/educationsuperhighway-launches-school-speed-test. Board Hears TLE UpdateThe Board also heard an update of the Roster Verification process, which is an integral part of the quantitative portion of the Teacher and Leader Effectiveness system. Roster Verification links students to teachers, allowing teachers to be credited for student achievement growth. The system is voluntary this year but will be mandatory starting next year. TLE Director Laura McGee said, in order to get accurate data for the value added portion of their evaluations, teachers need to be able to go into the roster and verify which students they taught and for how long. Next week, videos will be up on the SDE Website to help everyone understand the entire TLE system. Training on the system will be conducted in March, and teachers will be able to access the system in April and May, in conjunction with the state testing window. McGee also detailed the value added piece of TLE. Value added takes into account the projected growth of each student during a school year and credits the teacher with the growth each student achieves beyond the projection. Every teacher of every tested grade and subject will receive a value added score under TLE, McGee said. The manner in which the 35% quantitative score for teachers of non-tested grades subjects will be calculated has not yet been determined. A working group of over 160 educators is drafting recommendations for the TLE Commission to consider. Assistant General Counsel Stephanie Moser-Goins explained the four administrative rules that are currently open for public comment. The first proposed rule change would clarify the requirements of those scoring the tests of students with disabilities versus those administering the tests. The second change would eliminate the rules for mobile classroom facilities as that is no longer a requirement of the law. The third set of rules would revise transportation policy. The fourth would align accreditation language of new school designation categories to the language of the state's waiver from the Elementary and Secondary Education Act. The public comment period for the above proposed administrative rules opened on January 16, 2013, and will end at 4:30 p.m. February 15. A public hearing will be at 10 a.m. Feb. 15 in the State Board Room, Room 1-20, Oliver Hodge Building, 2500 North Lincoln Boulevard, Oklahoma City. The public is invited to submit comments on proposed changes to administrative rules during the open public comment periods via email at rules@sde.ok.gov. The rules can be found at http://sde.ok.gov/sde/education-law-book.